Make this wintry design to brighten your decor. This design combines sewing and embroidery in this appliqued pillow or wall hanging. An adorable design featuring a snow couple with a new baby. Pattern includes snowflake buttons to accent your design. Finished size is 12.5"x 14.5". 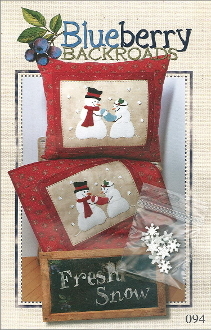 Includes instructions, paper patterns for applique, and embroidery pattern. Please be aware that this is NOT an iron-on transfer and must be traced on to your fabric via your favorite method.